Contrary to popular belief, we still have a blog.To prove that, here’s a little something we whipped up as part of our living room redesign. After over 6 years, we got ourselves a new couch. Along with that new couch, we moved our coffee table, and replaced it with an ottoman. Still following? Well, I hate to admit it, but we like to eat meals in the living room fairly often, and an ottoman just isn’t a sturdy table to eat off of. So, we decided to get ourselves a serving tray for drinks and plates. We didn’t see anything we totally loved, so we made one. We started with a basic wooden tray that we picked up at a craft store and painted it with Annie Sloan Chalk Paint. I’ve made things with milk paint before, and working with chalk paint is similar. While preparing this tray I quickly realized that it needed something extra to support the weight of drinks and plates so I reinforced it with two pieces of plywood on the top and bottom. The tray is about 12″ x 12″, so I bought a piece of 24″ x 12″ plywood and scored and split it. Chalk Paint is really easy to work with and doesn’t require priming. You could probably get away with 1 coat, but I did two. I painted the sides and handles but left the bottom and top unpainted because that’s where the plywood will be going. We decided to go with Annie Sloan’s English Yellow, which we figured would provide a nice contrast to the marine color of the ottoman, and the gray palette of the couch. I used wood glue to attach the plywood insert and let it sit overnight with some weight on it. While the glue was drying, I painted the insert for the other side. That right there is clear wax. To seal the chalk paint a regular poly won’t really work, it needs two coats of clear wax. The wax can be applied with a cloth, but also needs to set and then be buffed. I did one coat, buffed it out, let it sit overnight, and then did it all again. This should provide a watertight seal. There’s the final product. I think it looks pretty good with our other decor and it fit pretty well on the ottoman. I’ve seen a lot of info online about how chalk paint is difficult to work with, but I found it really easy to handle. We bought a relatively small amount of it and it went a long way. I’d like to try it on some other projects in the future, it seems like a good alternative to traditional paint and finishes. We’ve already talked a lot about painting in house #2, especially since that’s what we have been doing non-stop since we got the keys. We told you all about our love for using National Trust for Historic Preservation colors from Valspar and what the heck a “Hotel St. Francis Clay Angel” is, but we still just have so much to say about paint! Needless to say, we had a lot of leftover paint from our first house, so, naturally, we wanted to bring it along with us in case we found a need/want for it in house #2. We are definitely glad we did because there are a few colors we re-used in the new place! You may recall, we had 2 bedrooms in house #1. At first, we used the 2nd bedroom as an office. We originally painted this room a bright yellow color and quickly realized it was just too much. Then we started our subtle revolution! That’s when we fell in love with Wave’s Crest. We ended up revamping the office and turning it into more of a guest space, added some new, sophisticated bamboo blinds, a futon and the calming touch of Wave’s Crest. In house #1, we used Vanilla Steam when we painted our kitchen. We painted the kitchen tiles with our favorite go-to white color, Du Jour, and used Vanilla Steam to paint the walls above the tiles. This color is somewhat of a greige (gray-beige). However, it can pull a slight pinkish hue, depending on the light. In house #2, we used Vanilla Steam in our dining room. There is so much light in this new house (which we’re really excited about! ), so Vanilla Steam is perfect here. It does give off that almost pinkish hue, but I think overall, it flows very nicely with the rest of the colors in the house so far! This is a bathroom color, through and through! 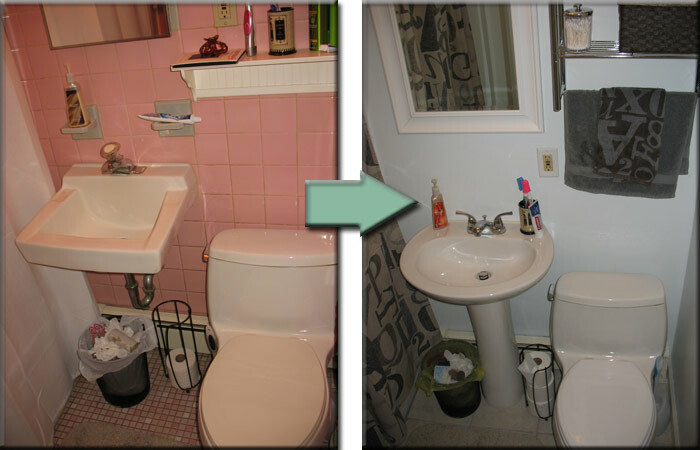 We used Fresh Day in the bathroom of house #1 and we used it again here in house #2. The serene feeling of a blue hue in the bathroom is calming and, well, clean! The before and after going from the previous owner’s green color to this lovely light blue is dramatic! It makes the mirrors and cabinets look completely different and we love it! We like to be adventurous, but we learned (the hard way) that if you’re too adventurous you end up with bad color flow from room to room. That’s why this time around, we opted to go for clean, subtle hues that were true to the classic, beach-y Cape Cod style of this house. We branched out with new-to-us colors like the sandy-hued Hotel St. Francis Clay Angel for the main living spaces in the house, as well as La Fonda Ecru, used in our small spare room. All in all, every color we are using in this house is true to the era, true to the home, and truly our style.